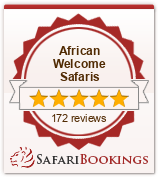 Plains Camp has four, luxury African explorer-style tents overlooking the spectacular Timbitene plain and waterhole. The camp is built in authentic pioneer tradition and is raised on wooden decks. Stylishly decorated, the 8-bed camp offers the tranquility of a 19th century naturalist’s retreat. An Africana book collection and antique treasures are reminiscent of a golden era. In keeping with the ethics of Rhino Walking Safaris “tread lightly on the land”, no trees were cut down in the construction of this camp. No concrete was used – all structures are canvas and wood. This camp was specifically designed for low energy consumption and makes use of generators for its power needs. Plains Camp is the ideal place for your Rhino Walking Safari. The camp is in the middle of a 12,000 ha private wilderness concession, where it seems the rest of the world no longer exists, and guests are ensured of superb game sightings. A typical day at Plains Camp begins with a mug of steaming coffee and traditional homemade rusks, after which guests set out on their morning walk, following rhino tracks and elephant paths. The length of the walks depend on the interest and fitness of the guests. Returning to camp, enjoy a leisurely brunch and relax in the cool of the acacia trees, keeping an eye on the waterhole for the breeding herd of elephant that frequently come to drink. Following high tea, set out again in the late afternoon for a walking safari or game drive and then indulge in a sunset cocktail. Plains Camp is close to Skukuza and is easily accessible by road or air. Guests wanting to enjoy a unique experience will be able walk out to our “Sleep Outs” on elevated wooden platforms (weather permitting).